Russia’s out-of-control Progress 59 cargo freighter is doomed to a fiery finale overnight Friday, May 8, according to Roscosmos, the Russian Space Agency. The errant spaceship is expected to fall back to Earth and reenter the atmosphere early in the morning Moscow time following the latest orbital analysis by Roscosmos. “The time window for the failed Progress spacecraft reentry in the Earth’s atmosphere was changed to a span between 01.13 a.m. and 04.51 a.m. Moscow time on May 8, according to Russia’s space agency Roscosmos,” according to the latest update today, May 7, from the Russian Sputnik news outlet. According to a Roscosmos source, the unmanned Progress 59, also known as M-27M , would most likely make the atmospheric reentry over the Indian Ocean. Roscosmos said in a statement that Progress 59 “will cease to exist” on Friday. Most of the debris is expected to burn up. But any remaining fragments are likely to hit north of Madagascar. Russian mission controllers lost control of the Progress 59 spacecraft ship – bound for the International Space Station (ISS) on a routine resupply mission – shortly after its otherwise successful launch on April 28 from the Baikonur space center in Kazakhstan atop a Soyuz-2.1A carrier rocket. Soon after detaching from the rockets third stage, it began to spin out of control at about 1.8 times per second, as seen in a video transmitted from the doomed ship. After control could not be reestablished, all hope of docking with the ISS was abandoned by Roscosmos. The 7 ton vehicle was loaded with 2.5 tons of supplies for the ISS and the six person Expedition 43 crew. Items included personal mail for the crew, scientific equipment, as well as replaceable parts for the station’s life support systems and a stockpile of water and oxygen, according to Russia Today. The Progress spacecraft is also loaded with a significant amount of fuel as it orbits Earth at an inclination of 51.6 degrees to the equator. This carries it over most of the populated world between 51.6 degrees north and south latitudes. But most of the area is over unpopulated oceans, making the chances of danger from falling debris very small. The latest ground track reentry prediction for the Progress 59 (M-27M) spacecraft showing orbital path around Earth as of May 7, 2015. Note: subject to change. Credit: Aerospace Corp.
To date the Progress vehicle have been highly reliable. The last failure occurred in 2011, shortly after the retirement of NASA’s Space Shuttle orbiters in July 2011. Roscosmos has established an investigation board to determine the cause of the Progress failure and any commonalities it might have with manned launches of the Soyuz rocket and capsule. “The conclusions are to be made by May 13, 2015,” according to a Roscosmos statement. The potential exists for a delay in the next planned manned Soyuz launch with a three person international crew later on May 26 from the Baikonur Cosmodrome in Kazakhstan. The ISS crew is in no danger and has sufficient supplies to last until at least September. Besides the Russian Progress cargo ship, the ISS is resupplied by the commercial US SpaceX Dragon and Orbital Sciences Cygnus vessels and the Japanese HTV. ESA’s ATV has been retired after 5 flights. The next Falcon 9 launch carrying the CRS-7 Dragon cargo ship on a resupply mission for NASA to the ISS is slated for mid-June. The most recent Dragon was launched on the CRS-6 mission on April 14, 2015. 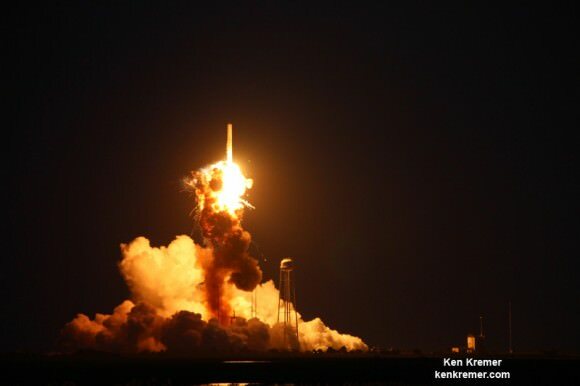 The last Orbital Sciences launch of an Antares rocket with the Orb-3 Cygnus resupply ship ended in a catastrophic explosion just seconds after liftoff on October 28, 2014. The ISS lifeline hangs by a delicate thread. According to http://www.federalspace.ru, the Progress spacecraft entered the atmosphere on May 8th at 05:04 am Moscow local time. This translates to May 7th, 9:04 pm Central Time in the US. As Rickman2k said, this would have placed it above the central Pacific Ocean. If anything survived reentry, it’s likely laying on the ocean floor by now. I’m thankful that this didn’t happen over any populated areas – though it would have been spectacular to see! The blankets are made possible by the fact that Soyuz and Progress are enclosed in fairings during the ascent phase of the flight. Dragon is not, so must have it’s thermal insulation on the inside. Dr. Kremer, any word whether this incident will effect the next Russian launches? Isn’t the next manned mission on the same version Soyuz?